How You Envision Crafts with your Child: Creating memorable keepsakes, using her handprints and footprints – a “forever” memento of her childhood. Crafting beautiful origami flower gardens that not only cultivate your daughter’s fine motor skills but knowledge of the world around her. Finger-painting Monet-like images with her that you will frame and keep always. Real Life Crafts with your Child: Glitter strewn across your kitchen, especially between the slats of the wood floor that will never come out. Paint all over your table and toddler while the paper remains immaculately clean. And of course, your child busily is gluing herself to the dog after she has colored her face. It’s no wonder that many moms don’t relish crafting with their toddlers, leaving it instead to preschools and day cares. 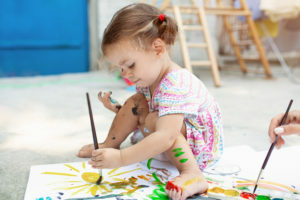 However, somewhere between Image A and Image B, we have some fun, creative yet age-appropriate crafts that you can do with your little one – without losing your sanity. They may not be Picassos you will cherish forever, but they will definitely be refrigerator-worthy spring creations. And at the end of the day, it’s not about the result but the time you spend with your child. So, unlock the Crayolas, paint, and the Elmer’s glue; take out the construction paper and crate the dog! You’re about to have some springtime fun with these great spring crafts for toddlers! Egg-Carton Caterpillars: This is an oldie but a goodie because these little crawlers – and all things butterfly – never go out of style! First, take an egg carton and cut it down from two rows to just one. You can decide how long you want your caterpillar to be and cut away any extra. Next comes painting which you can make simple with just 1 or 2 colors or get creative with several. Googly eyes (that can glue or even stick on) and some pipe cleaners and you’re all set! Make just one or create a caterpillar family that your daughter will adore! Combine with some educational reading (The Hungry Caterpillar, for instance) and you’re Mom of the Year! Color It Rainbow: There are so many variations on creating a rainbow so you can choose what works for your toddler. A simple idea that focuses on the fine motor skill of cutting is to make a rainbow out of interlaying circles – red as the biggest, then glue orange within it, yellow and you get the picture. Once you have the wheel created, you can cut it in half for two smaller rainbows. Use construction paper or if you want to do some coloring, white paper. Glue some cotton balls to the bottom and you’ve made a lovely rainbow coming out of the clouds. One note: as Mom, you may want to trace the circles for this craft so that they’ll actually lie within each other properly and not be the wrong sizes. As for Rainbow Idea #2, we’re taking popsicle sticks, painting them our ROYGBIV colors and then gluing them to cotton balls – less cutting, but still creative! If paint is really your little one’s jam, then a thumbprint painted rainbow, complete with cotton clouds, on a piece of white paper will delight her for – well, minutes. We are talking about toddlers, after all! Flowers, Flowers, Everywhere! Spring is when the world starts to bloom! So why not create a lovely springtime bouquet? There are so many options for making fun flowers. Use cupcake liners, flattened out and then folded to create the blossoms. Then use Popsicle sticks, crayons, paint, or even pipe cleaners as the stems. Get creative with buttons or puff balls for the flower center or pistil. Your toddler can glue her flowers to her paper and create whatever setting or backdrop her heart desires. If bigger is a little better, you can use a larger sheet of paper and have your little one handprint her flower petals. Or, use paper plates and create any number of flower patterns and colors. Paint, crayons or good ‘’ole” construction paper make for wonderful stems as you and your child are creating this garden. Flutterbies or Butterflies: Young or old, who doesn’t love seeing a beautiful butterfly? For this activity, you need coffee filters (as a toddler mom, you probably have LOTS of coffee filters! ), some markers (preferably dot markers), clothespins and pipe cleaners. You also want a small spray bottle filled with water. From here, lay your coffee filter on a plate or a pie tin. Take your dot markers and start dabbing the coffee filters, using as many colors as you can. From here, lightly spray your coffee filter with water and watch the colors start to blend into each other. Once the coffee filter is dry, you simply pinch it in the middle with the clothespin and fluff out the wings on the side. Cut a short piece of pipe cleaner that you can bend into a U and you have your antennae. Voila – you have butterflies for your flower garden! So enjoy these – and other springtime crafts – with your little one; enjoy seeing the world through her eyes (“prurple” stems and all) and most of all, have fun!